Today as never before, the importance of maximising the productivity of your industrial plant and equipment is becoming increasingly vital. Reducing downtime, lengthening plant life and reducing servicing intervals all mean that mechanical plant and equipment remain in service for longer – giving you improved productivity. Ensuring constant lubrication to vital moving parts at all times means less wear and tear, lower risk of field failures and lower maintenance costs. This is where Interlube Limited can help. Our manufacturing and sales offices in the UK and USA, linked to our international network of distributors and service engineers means that no matter where you are located, Interlube will supply all of your lubrication needs, designed exactly to match your demanding applications. Our systems operate in some of the harshest, most contaminating and abrasive environments. From deserts and oil fields and from steelworks and construction sites to many industrial process applications you will find Interlube systems. 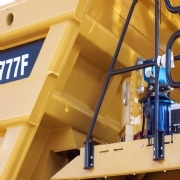 From the simplest single line manual lubrication system to the most complex microprocessor controlled automated installations, our unrivalled expertise in the construction plant sector means that we truly understand the needs of our customers by keeping all on and off-road plant functioning in the most demanding of locations – reducing downtime and maximising investment. 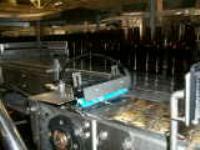 We operate in many areas of the food processing industry – from palletisers and can/bottle filling equipment to conveyor and chain lubrication systems. This means that our customers can rely completely on their lubrication equipment providing trouble free operation and complete peace of mind. Across the globe, Interlube systems are used on a wide range of agricultural machines in the harshest natural environments – ensuring our customers get the most from their plant – reducing service intervals and running costs. We operate internationally in open cast mining environments. The revolutionary Interlube Electric Keg Pump System, which has a fully automated monitoring facility, is now being installed at many Open Cast Coal Mines throughout Europe. Customers are discovering that, amongst other things, there is no reservoir re-fill requirement, only a grease keg which needs changing periodically. This innovative system also monitors the correct and continuous operating facility, indicating to the operator if a vital grease point is not been served. The Interlube Keg system will not airlock, unlike conventional systems, so any grease distribution blockage can be quickly and easily identified. The system can be connected to a hose reel facility so that smaller operating units can also be lubricated in tandem. 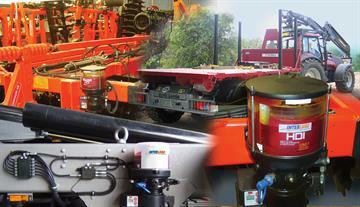 Our customers know that they simply cannot afford to have expensive agricultural plant break down or fail in the field. Our lubrication systems ensure all vital moving parts – bearings and linkages are lubricated whilst the machine is in use. Not only do we manufacture all of our systems – our subsidiary Interlube UK Ltd is one of the UK’s largest designers and installers of bespoke automated centralised lubrication systems plus providing a complete international after sales service. So when it comes to ensuring our systems provide you with the best possible on-going performance, MSP ensures an exact match between your requirements and the solution -- no matter where in the world you demand it. 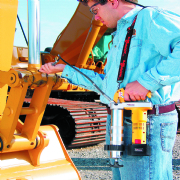 Standard Chain Lubrication system using the NEW Interlube "ACR" electrically operated Oil pump. The pump will deliver precise amounts of oil as and when required with the volume of oil being delivered to the chain exactly whwere required on the chain link .